Entrepreneurial Badges for the girl scouts. Entrepreneurship is the act of being an entrepreneur, which can be defined as "one who undertakes innovations, finance and business acumen in an effort to transform innovations into economic goods"
Some of you might have already heard of or experienced the Lemonade Stand Game. To experience what it would mean to be an entrepreneur and take on the challenge of being your own boss. 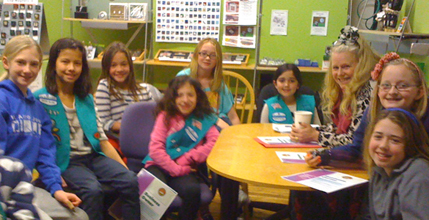 A friend asked me if I would meet with her daughter’s Girl Scout troop for their entrepreneurial badge. Being an entrepreneur and having been a girl scout myself I gladly agreed. The girls arrived at Ahlers Designs promptly and we began our journey into entrepreneurship and how it would apply to their lives and future plans. I explained that an entrepreneur is someone that starts a company based on something that they love to do, or they have an innovative approach to some market that already exists, or have an idea for a new market. We reviewed the ideas of focusing on your skills and customer service.To make is real for them I titled the session” How to run your lemonade stand.”We went around the room and I asked them what they loved to do. Then we went around and I asked them had they ever had a lemonade stand and we started the discussion about what you need to run that “lemonade company”. The first girl said you need lemons and sugar. The next girl said, “ you need lemonade mix.” That made my point. How you run your business, using different approaches, innovative solutions, that is what makes an entrepreneur. After much discussion I went around the room and asked the girls to name their company. I told them, “ to make it happen you have to see it”. When the young lady that had said she like to write music said her company was gong to be called “Motivational Music” I got goose bumps. We are all on our journey. We need to inspire and motivate our youth to dream and build a better world for all of us.